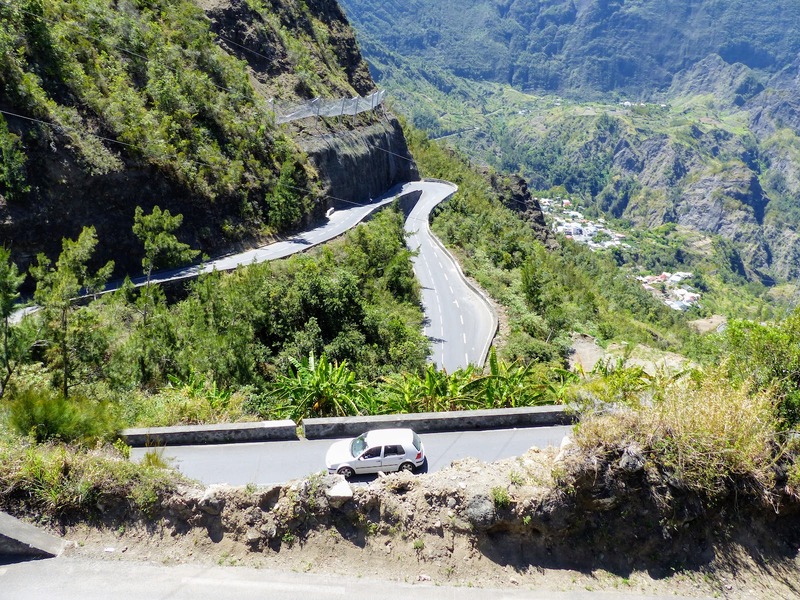 Réunion is a French island in the Indian Ocean, east of Madagascar, and about 200 kilometres southwest of Mauritius. 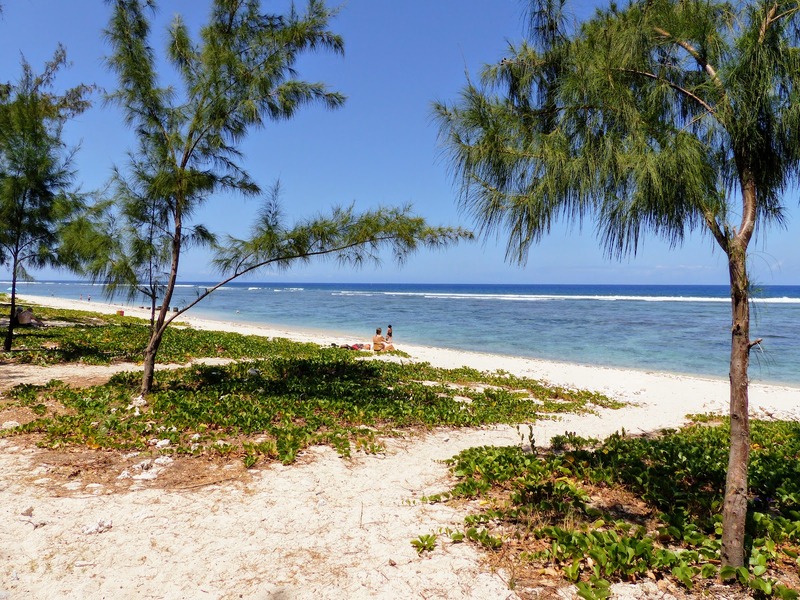 It is the largest of the three Mascarene Islands the other two being Mauritius, the nearest island, and Rodrigues. The island is 63 kilometres long and 45 kilometres wide and is located above a hotspot in the Earth's crust, being created within the last 3 million years. Mauritius, formed between 7 and 10 millions years ago, is the oldest of the existing volcanic islands. It is hard to believe that such a remote island is an outermost region of the European Union and, as an overseas department of France, is part of the Eurozone. 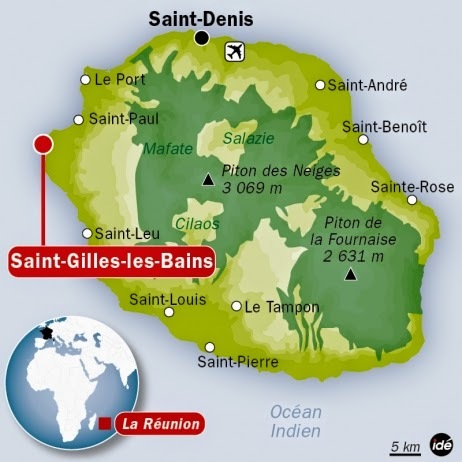 The airport is located in the capital, Saint-Denis in the north of the island. The landscape of the south-east is dominated by lava fields from many eruptions, some very recent, from the highly active volcano Piton de la Fournaise, which is over 530,000 years old. It is one of the world's most active volcanoes, with over 150 recorded eruptions since the 17th century, the most recent being only 5 months ago. We drove through the village of Piton-Sainte-Rose, which was evacuated in 1977 before it was inundated by a lava flow which destroyed several buildings. The lava flow crossed the highway and surrounded the local church, entered the front door, then stopped without destroying the building. The front entrance was later cleared, and the church was brought back into service under the name of Notre-Dame des Laves ("Our Lady of the Lavas"). For our first 2 days we stayed in the island's main tourist area, in the north-west, with its lagoon and white coral beaches, similar to those on Mauritius, where we stayed 21 years ago after Minerals Engineering '93 in Cape Town. After a day lazing by the beach and hotel pool extreme boredom set in, so we checked out earlier than planned and headed inland to the much more interesting and cooler interior. 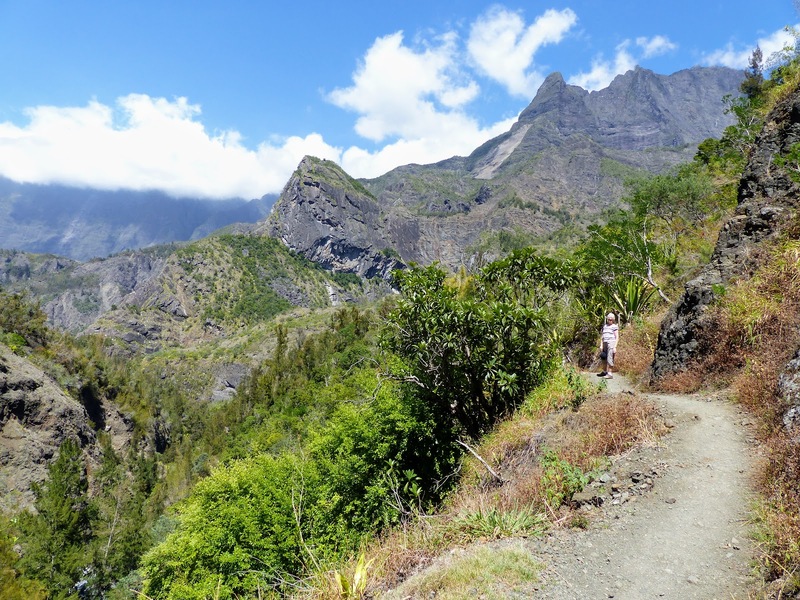 At 3069m the towering volcano Piton de Neiges dominates the interior of the island. 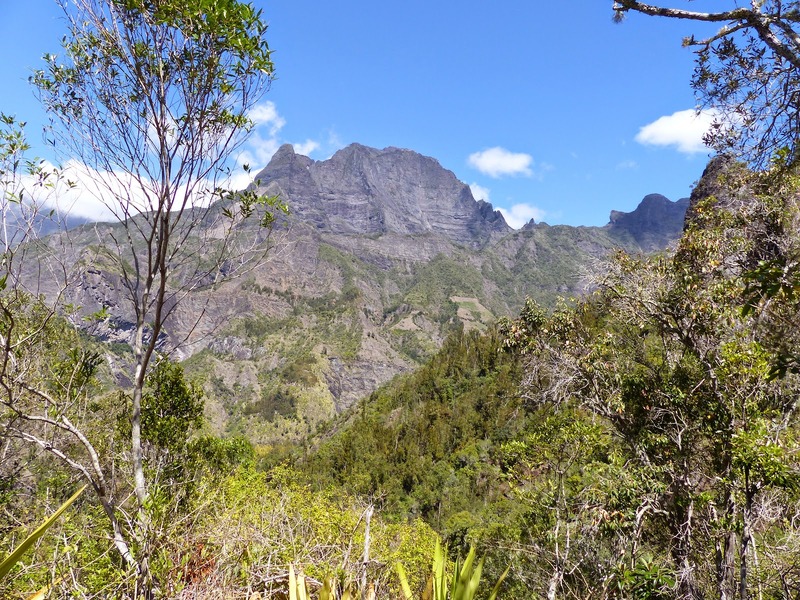 It is the highest point on Réunion and is considered to be the highest point in the Indian Ocean. 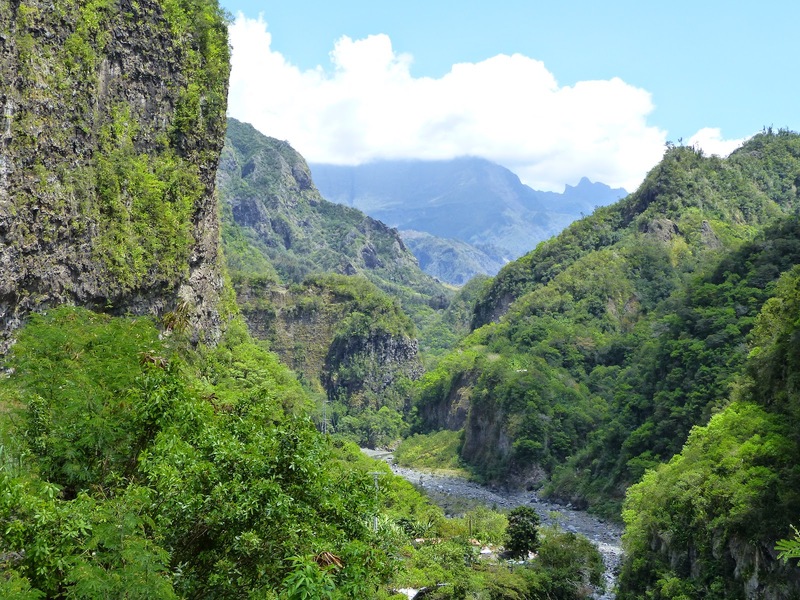 The volcano was formed by the Réunion hotspot and emerged from the sea about two million years ago. Now deeply eroded, the volcano has been inactive for 20,000 years and erosion has formed three huge calderas, natural amphitheatres known as the Cirques. An incredibly winding road, which our underpowered rented Peugeot 208 only barely negotiated, took us through spectacular volcanic gorges to the attractive town of Cilaos, situated at an altitude of 1214m in one of these calderas. The Cirques attract hikers to the island, and with very good reason, as the numerous challenging trails wind their way through rugged scenery as good as we have seen anywhere. But you need to set off very early to enjoy the panoramas, as the clouds gather and descend down the caldera rim in the late morning. 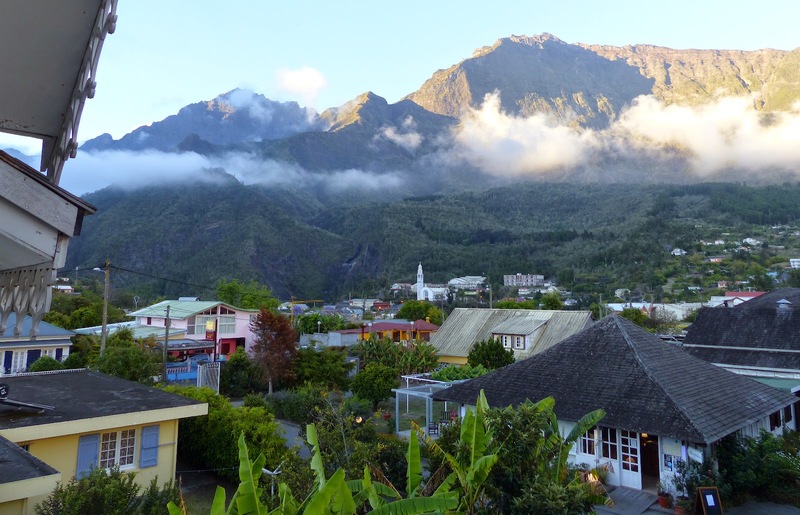 So how do we rate Réunion? For those who like to sizzle in a hot tropical sun, then neighbouring Mauritius might be the better place for you, with its superior beaches, food and water sports facilities. 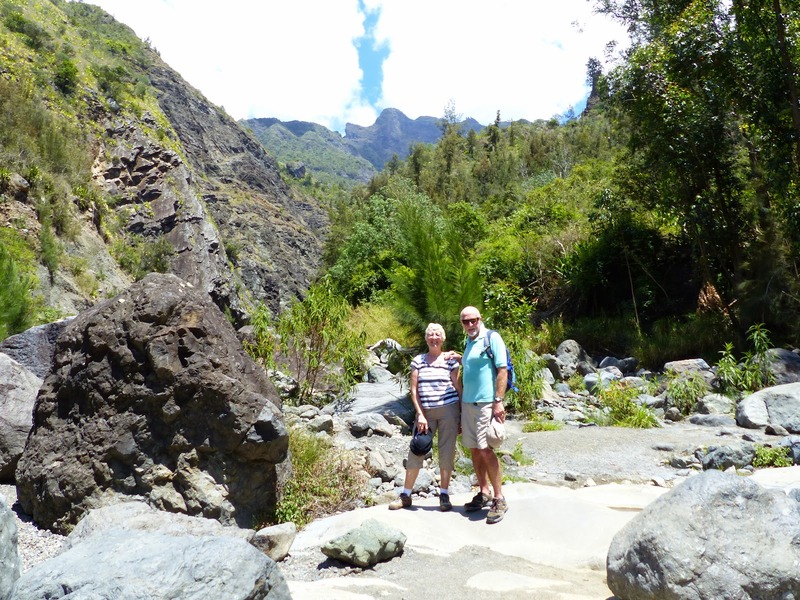 But if hard hiking is your thing, then Réunion could well be added to your list of places to visit. The massive Piton de Neiges forms two thirds of the island and there are very many hiking trails within its three Cirques. We visited only one of these, and only scratched the surface of the hiking available, so it is not surprising that many people repeatedly return to this fascinating volcanic island. 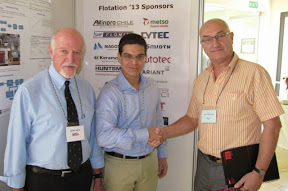 During last week's conference in Cape Town, I got the chance to review the latest report on Minerals Engineering, with Elsevier's Executive Publisher Dean Eastbury, who looks after not only Minerals Engineering, but International Journal of Mineral Processing and Hydrometallurgy, the three journals in our field with the highest impact factors. This was an end of year report, an update on that reported in the posting of 6th August, which had great news of the journal's Author Feedback Programme, and the statistics in the report reflect the great demographic changes that are taking place in the minerals industry. 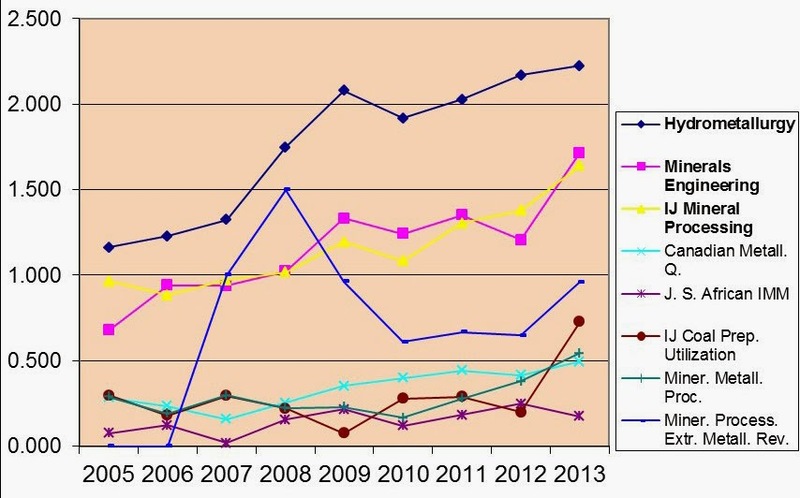 The flow of papers to the journal is steadily increasing, one of the reasons why we recently appointed Dr. Pablo Brito-Parada as Associate Editor, but the rejection rate has increased from 63% in 2013 to 67% this year. Australia provides by far the most accepted papers, followed by Canada and China, Australia also showing the largest increase in papers, while papers from South Africa show the largest decrease, possibly due to the current state of the mining industry in that country (posting of 25th June). Similarly paper flow from the UK is on the wane. It is interesting that Australia has the lowest rejection rate (15%) of all submitted papers, while China has one of the highest rejections rates of 89%. Chinese authors submit more papers to the journal than any other country by a huge margin, around 32%, so contribute in a big way to the journal's overall rejection rate. Not so long ago, at the IMPC in Beijing, Minerals Engineering and IJMP were involved in a workshop for Chinese authors, but it is apparent that lessons have not been learned, and before submitting papers I would strongly urge authors to read the Guide to Authors carefully, and to ensure that there is innovative work in their manuscripts and that they are relevant not only to a specific ore or material. ScienceDirect downloads continue to astound me, and these are also on the increase, with well over 460,000 by early October of this year, compared with over 430,000 in 2013. China contributes around 25% of the downloads, and shows the highest rate of increase, again highlighting the ever increasing importance of this country to the worldwide minerals industry. 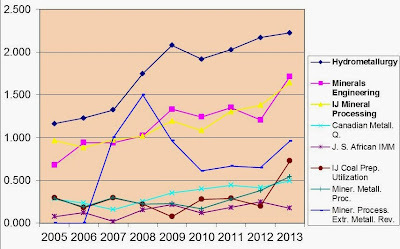 At last months IMPC in Chile, it was reported that there are now 33 Universities and colleges teaching mineral processing in China, and more than 20 research institutes dedicated to mineral processing, with the largest number of students, teachers and researchers in the world, whereas most of the minerals engineering programmes in western universities have died or are dying. The world of minerals is changing rapidly, and it will be interesting to see how the evolution is reflected in next year's journal report. A final reminder that if you wish to present papers at Precious Metals '15 and Nickel Processing '15, which will run back to back in Falmouth in May, short abstracts must be submitted by the end of this week. As always, papers presented will be considered for special issues of Minerals Engineering. It's always difficult to tear yourself away from Cape Town, but a great week at Process Mineralogy is now at an end. Jon and Amanda left last night for London, and Barbara and I leave the Vineyard today for Johannesburg and then on to Reunion Island for a week's holiday. 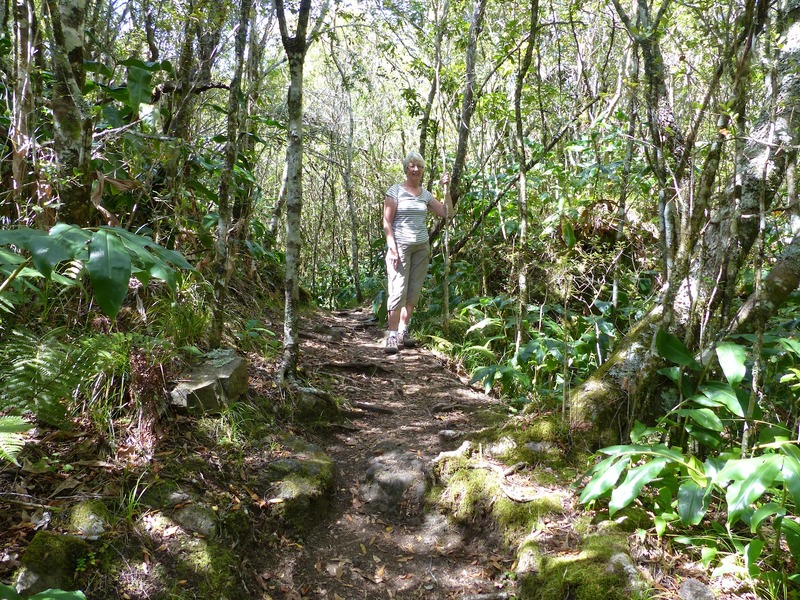 Yesterday Jon, Amanda, Dean Eastbury and I spent a few hours hiking the Table Mountain contour path, between the impressive Cecil John Rhodes memorial and Kirstenbosch Gardens. We will be back of course- next November for Flotation '15. Unfortunately gale force winds forced us to abandon the hike to the top of Table Mountain today. 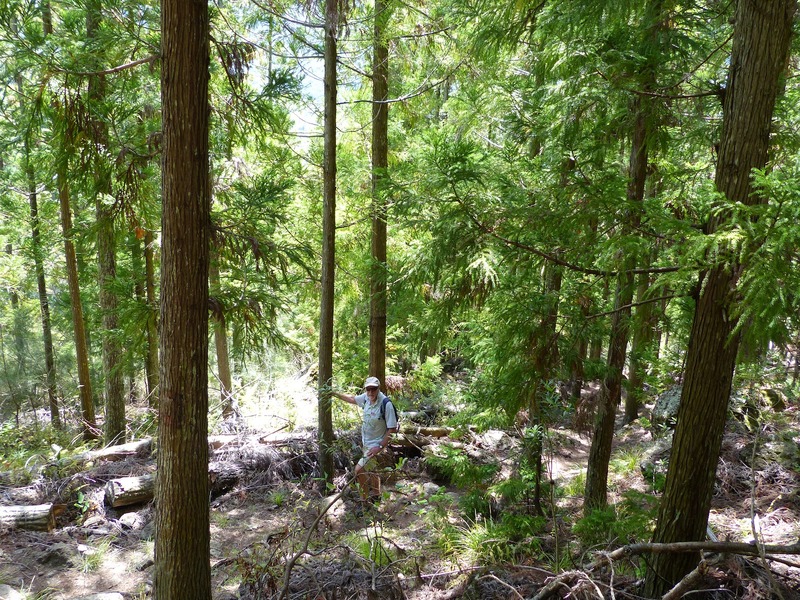 However, Jon and I did manage a short hike with 10 of the Process Mineralogy '14 delegates. 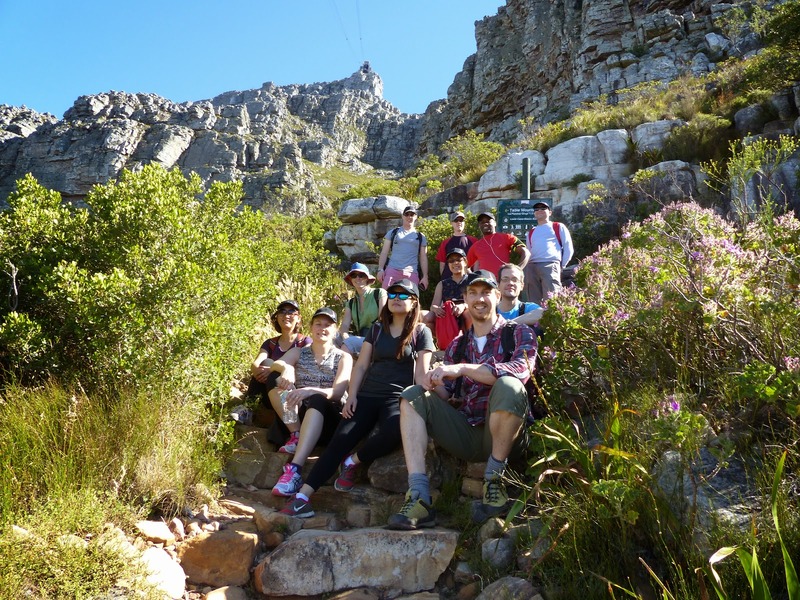 We climbed up to the Table Mountain contour path via the Platteklip Gorge trail, and walked the relatively short stretch to the lower cable way. The atmosphere of Process Mineralogy '14 is, I hope, captured in this 7 minute video. The last technical session of the conference contained a number of case studies involving mineralogical characterisation to optimise processing of various ores. Following lunch there was an interesting panel discussion on the future of process mineralogy, which I shall report on at a later date. Amanda then closed the conference and invited delegates to attend Process Mineralogy '17, in March 2017. She thanked the sponsors once more for what has been a fine event, before we all enjoyed the late afternoon sunshine in the Vineyard gardens for a farewell wine function. The Vineyard is a superb venue and I would like to take the opportunity of thanking the friendly and very professional staff, pictured below, who in no small way contribute to the success of MEI Conferences in Cape Town. Kirstenbosch Conference Dinner. How was it for you? Moyo's at Kirstenbosch is a new venue for MEI, but it is always exciting to hold a conference dinner in a new location, and last night's Process Mineralogy '14 event lived up to all expectations. But we would really like to know what you thought of it- the venue, the food and the entertainment. How was it for you? The application of automated mineralogy to predict acid mine drainage was the subject of the first three papers this morning, which included a fine keynote from Bern Lottermoser of Camborne School of Mines (CSM), UK. Prof. Lottermoser is one of four delegates with CSM connections. Ben Thompson is a 2012 MSc graduate in mining geology, and will be presenting a paper tomorrow, co-authored with CSM colleagues. Gaynor Yorath, of University of Cape Town, is a regular at MEI Conferences. She is a 1985 CSM graduate in mineral processing technology. It was good to meet Ofonime Udoudo, one of two University of Nottingham delegates. After graduating in Nigeria, he obtained his PhD at CSM, and is now researching the vermiculite exfoliation system by process mineralogy, the subject of his afternoon paper. It has been another long day, with 14 papers presented, finished off nicely by a trip to nearby Kirstenbosch Botanical Gardens for the conference dinner in the most perfect of settings. During my time on the Nchanga Concentrator in the early 1970s it is hard to believe now that, despite the wide suite of copper minerals, there was not even an optical microscope in the metallurgical office. If the tailings assay was creeping up, the answer was to add a little more reagent to the head of flotation, with little thought that the high assay may have been due to poor grinding, or the presence of poorly floating minerals. I have to pinch myself sometimes when I see some of the sophisticated instruments that are now available and which are being productively used by metallurgists worldwide. Some of these are currently being displayed at Process Mineralogy '14. This morning I was chatting to Monica Kalichini from Kansanshi Mine, also in Zambia. She has been working with Gaynor Yorath and Megan Becker at the University of Cape Town on the characterisation of the Kansanshi mixed ore, using an FEI FEG QEMSCAN, to link fundamental mineralogy to flotation response, something sadly lacking during my Zambia days. Kansanshi has purchased the new Zeiss Mineralogic Mining Automated Solution, pictured below, and is being trained by Igor Tonzetic of Zeiss. She hopes to present her work at Flotation '15 next year in Cape Town. Jon and MEI consultant Megan Becker opened the conference this morning and welcomed the 75 delegates from 15 countries to Cape Town's wonderful Vineyard Hotel. Pertti Lamberg, from Sweden's Lulea University of Technology, then got us off to a fine start with his keynote presentation "A way forward in process mineralogy – using automated mineralogy for modeling and simulating beneficiation processes". After a long day of 16 presentations, the 'happy hour' in the hotel gardens gave us a great opportunity to network with some really friendly and interesting people, boding well for the next two days. The sun is shining, the temperature is rising, and delegates have been drifting into the Vineyard from around the world, making full use of the hotel's wonderful gardens and pool nestling under Table Mountain. In the late afternoon around 40 delegates attended the pre-conference welcoming reception, in anticipation of three rewarding days at Process Mineralogy '14. When we left Cornwall on Thursday it was pouring with rain and 16C. When we arrived in Cape Town yesterday it was pouring with rain and 16C! Today has been dry but chilly, so no pre-conference relaxation by the Vineyard pool. This morning I watched a bit of cricket in the ground opposite the hotel, surely one of the most spectacular settings anywhere. Jon and Amanda arrived in the morning, and in the afternoon I was in the bar with Elsevier's Dean Eastbury, watching England lose narrowly to South Africa in the rugby match at Twickenham. During the interval I was surprised and pleased to catch up with Malcolm Powell, from the JKMRC, with his Global Comminution Collaborative (GCC). He and his team had been in Johannesburg for an AMIRA P9 meeting, and were in Cape Town to meet up with UCT's Aubrey Mainza to discuss the next extension to P9. The GCC is a great initiative and we look forward to hearing more from them at Comminution '16. Barbara and I are just about to leave for Heathrow, Jon and Amanda follow tomorrow. We are off to Cape Town for Process Mineralogy '14, which starts on Monday. This is a much smaller conference than the previous two process mineralogy conferences, as times are hard in the mining industry at the moment due to falling commodity prices. The fortunes of the minerals industry rise and fall in cycles and we have learned that we must ride out these troughs and look forward to better times. Many of the regular faces will be missing next week due to companies cutting back on their travel budgets, but there will be quite a few new people to meet, so we look forward to an interesting week. I will be publishing brief highlights each day, here and on Twitter (@barrywills) and a full report with photos is scheduled for publication on December 2nd. Sustainability was a major feature of last month's IMPC in Santiago. Reducing energy consumption is of major importance, but managing and reducing water consumption is now recognised as being of equal importance. In a timely article in Minerals Engineering, CSIRO authors stress that maintaining the integrity of the local environment and ensuring a secure supply of water should continue to be the focus for water management at individual operations. At a corporate level there is a growing need for improved understanding and recognition of a company’s reliance on indirect water, and the risk factors that occur from operating in different regions. Nationally and internationally, accounting for water impacts can assist in ensuring global demands for mineral and metals are met with minimum impact on water availability and security. The study shows that the results of water footprint based analysis can be used to identify opportunities for process improvements, to prioritise water efficiency and guide infrastructure investments. Building resilience to water risks by understanding and managing direct and indirect water use will reduce the overall water supply risks facing a business, particularly when operating in water stressed regions. Due to scarcity of fresh water and stringent regulations on the quality of discharged water, more and more flotation plants have to use groundwater, sea water or recycle water with a high concentration of electrolytes. Although a number of studies have been conducted to investigate the effect of saline water (or salt solutions) on mineral flotation, effective ways to solve the problems encountered in mineral flotation plants using saline water are currently not available. In another recently published paper workers from the University of Queensland review published articles addressing the effect of saline water on the interfacial phenomena taking place in the flotation process, such as surface wettability, bubble-particle collision and attachment, mineral particle interactions and frothing. The review provides an overall picture of the current status of studies in this area and pinpoints directions of future research to address different problems associated with using saline water in mineral flotation. I invite your comments on these important papers. In the 19th Century, the world's largest sources of copper and tin were in south-west England in the county of Cornwall, and to a lesser extent in neighbouring Devon. The mines in the Camborne-Redruth area were the deepest in the world, and this area is often regarded as being the birthplace of modern mining. As copper and tin mining declined in the region, miners took their experience to all parts of the world, including the deep gold mines which were opening up on South Africa's Witwatersrand. The legacy of this once proud industry is now only the famous engine houses, and ruins of dressing floors, which can be seen in many postings on the blog. For those who wish to delve deeper into the history of mining in these two counties, a book has just been published which provides detailed statistics on the mines of the region. Mining in Cornwall and Devon is an economic history of mines, mineral ownership, and mine management in the South West of England. 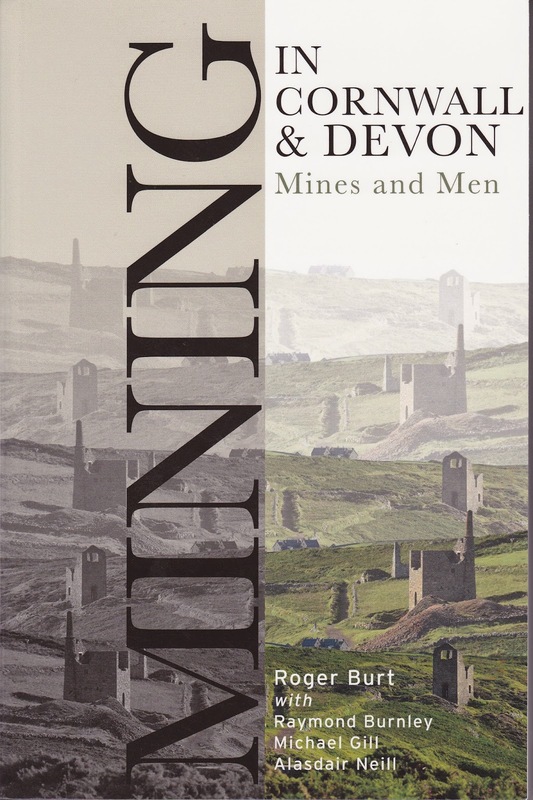 It brings together material from a variety of hard-to-find sources on the thousands of mines that operated in Cornwall and Devon from the late 1790s to the present day. It presents information on what they produced and when they produced it; who the owners and managers were and how many men, women and children were employed. For the mine owners, managers and engineers, it also offers a guide to their careers outside the South West, in other mining districts across Britain and the world. A long section on the Duchy of Cornwall provides details of the Duchy's role as the largest mineral owner in the South West, and of the modernisation and changing administration of the Stannaries. The book is available from University of Exeter Press.